MOSCOW, March 19. /TASS/. Law enforcement officers prevented any serious violations of public order at polling stations during the Russian presidential election, the Russian Interior Ministry’s press service reported on Monday. "The measures taken by law enforcement agencies in cooperation with executive bodies and election commissions helped prevent any serious breaches of public order," the ministry said. The bureau stressed that the Interior Ministry and the Federal National Guard Troops Service fully implemented a package of measures to ensure the protection of public order and security in the run-up to and during the course of the election. About 275,000 Interior Ministry employees, 81,500 members of the Federal National Guard Troops Service, 21,000 members of private security companies, 46,700 members of the Voluntary People’s Guards and public groups, as well as 7,400 Cossacks were on duty to maintain security during the election. The ministry noted that the number of crimes committed, car crashes and administrative violations dropped during Election Day. 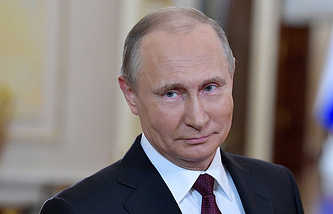 According to the latest data from the Russian Central Election Commission, incumbent Russian President Vladimir Putin is leading in the election, with 76.65% of votes after processing 99% the ballot count by the district election commissions. CPRF candidate Pavel Grudinin ranks second with 11.82%, followed by LDPR candidate Vladimir Zhirinovsky, who has 5.68% of the vote, occupying third place.